Have you ever wondered how to wear a shirt dress? This uber-comfortable and classic look is making a comeback! What’s so great about a shirt dress? It’s so versatile! You can wear it to work and then head straight into the weekend with the same piece of clothing. Here are 3 ways to wear a shirt dress. Shirt dresses can be loose-fitting, so make the look more ladylike by creating a cinched-in waist with an interesting belt. Shirtdresses will come with a belt, but most can be removed and replaced with another one. 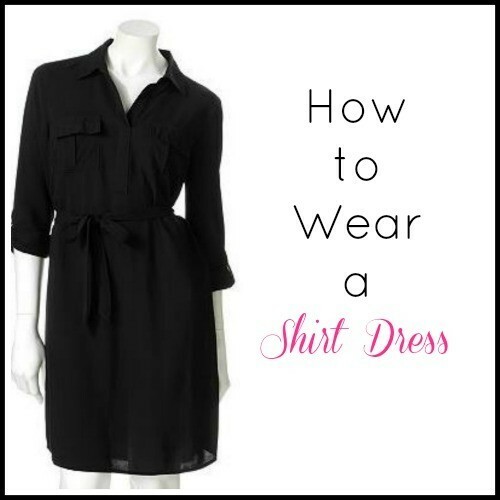 This is especially important if wearing a shirtdress to the office. Wear a shirtdress over leggings or pull on a blazer for a chic look. For the more daring fashionista, try layering a chambray or denim shirtdress over a lighter sundress. Choose accessories that complement the look you’re trying to achieve. If you’re going casual, layer on a light scarf and don sandals and sunglasses. If you want to go for a dressier look, opt for a statement necklace and wedges. Shop more shirt dresses here.